I have hunted elk all over the western U.S. for trophy bulls and after finding bull basin ranch has become my favorite hunting area . I have hunted with Lee cox four times now ,and sent many of my friends to hunt with Lee at Bull Basin Ranch. It is the absolute finest elk hunting any were in the country. The hunting quality and mass of the bulls is amazing . Lee is one of the finest guides I have meet, and you wont find a better straight forward more friendly person in the hunting world. The whole experience is first class right up there with the best of my hunts . I Have hunted all over the world taken many fine trophies from around the world. 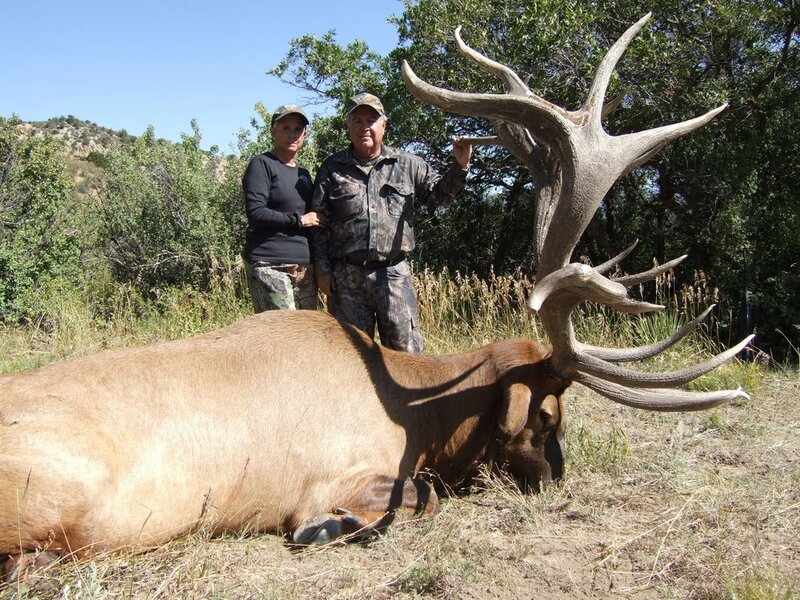 I have hunted with Lee Cox many times taking some of the finest elk in the world while hunting from there ranch a 617 world record and a 595 world record bull . I had hunted elk on a couple of occasions, with no luck, Intent on finding a place I would have a great opportunity for an elk. After meeting Lee and learning about Bull Basin ,I was confident i’d found the place. It did not disappoint! Lee and his team were excellent hosts. The accommodations were great ,meals fantastic, guides&staff helpful and friendly,and the hunting was excellent. The number and quality of elk were amazing , So many opportunities. My wife went with me and had a great time as well. If you are interested in hunting a high quality elk, I recommend Bull Basin. I would like to thank the whole crew and all the guides at Bull Basin Ranch. Our company set up elk hunts with bull basin for fall 2018 . We hunt once each year around the US and Canada. this was the fourth elk hunt we had been on over the years and it was the best hunter we have been on for elk or other hunts included . We had such a great time and the hunting was so good we are going to come back again in 2019. Can’t wait . To say that Lee runs a professional operation is an understatement , everything was amazing . The elk hunting and scenery was crazy. I just wanted to say what a wonderful experience and hunt we had this this year at bull basin ranch. I am getting up in years and wanted to go on an elk hunt. I also wanted to bring my wife along and so glad I did ,we both had a superb time. The lodge is so beautiful and all of the great elk mounts in side ,setting watching the fire in the fireplace each night telling and listing to stories after an amazing dinner. Then the elk we were in elk every day. Listing to bulls bugling in the aspens and pine trees was a great way to spend the day . I took a huge 6 by 6 bull the morning of my 3rd day of hunting was one of my fondest hunting memories . There so much to say ,but I just end with you made and old mans dreams of the perfect elk hunt come true ,Thank you so much. I hunted with bull basin ranch and wanted to say what a great experience it was . The whole staff guides and Lee were so great . And the lodge and food was amazing way beyond anything I expected . Everyone went out of there way to make sure everything was perfect and it was. The hunting and scenery was incredible .The beautiful aspen trees and pines with all the elk that we saw during our hunt is an experience I will take with me . I took a bull of a life time and had the hunt of a lifetime . IT DOESN”T GET ANY BETTER THAN THIS ! Lee & Jennifer personally assure a warm and gracious hospitality at there spacious & beautiful lodge at bull basin ranch. Joe there full time professional chef assures delicious meals,and knowledgeable -professional guides assure a great hunt on the beautiful ranch in the Colorado mountains outside of montrose. Of course the elk are the “main event” and you won’t be disappointed lots of magnificent BIGG bull elk. I personally took a huge 9-10 year old bull which will go around 518. A superb trophy to remind me of the very best experiences in my 55 years of hunting . There are few things in life which actually exceed expectations. bACK HOME AND WANTED TO SAY AGAIN THANK YOU FOR A REALLY EXCEPTIONAL OUTDOOR EXPERIENCE. tHE WHOLE EXPERIENCE EXCEEDED MY EXPECTATIONS WAS A PERFECT ADVENTURE.wONDERFUL STAFF AND FRIENDS ,GREAT ACCOMMODATIONS,AND FOOD ,OF COURSE THERE WERE THE ELK ! OH MY GOSH !JUST AWESOME! pLEASE SHARE MY APPRECIATION AND BEST WISHES TO HUNTER FOR HIS GUIDING AND SUPPORT IN TAKING THE BULL. hE FOUND IT, TRACKED IT, DID A GREAT JOB. This was the best elk hunt I have been on . I have been lucky to have hunted elk in almost all of the states that have elk , but never taken a good trophy bull just a few little rag horns over the years . The hunt here at Lee’s ranch was an amazing experience. Huge bulls calling ,tearing up pines trees , covered in mud Just like I dreamed of the perfect elk hunt. I took a 419 inch 6 by 6 bull with my bow on the morning of the third day after passing up a few and a few blown chances it all came together. The people here are great just a lot of fun to be around and made the hunt all that much better. The food and the lodge are over the top . Thank you so much and a thank you to my guide Hunter what a great young Man . We hunted at bull basin ranch for elk and buffalo. This was one of our finest hunts our group has been on . from the scenery of the ranch and the quality of the elk hunting and fishing . Need to mention the fishing we spent several hours mid day fly fishing some of the lakes on the ranch and had the time of our lives .3 to 10 pound trout on a fly rod was a kick . we took six bulls from a 395 up to a 440 monster that was 70 inches wide. No shortage of huge bulls . If you are looking for a 400 plus elk this is the place to go . The lodge was extremely nice and the meals were amazing and bar had us excited to come in for dinner each night . The only bad thing on the whole hunt is having to leave . I tried to get a job as a guide, but no luck . Thanks guys was a great trip . I was looking for an elk hunt and lodge that I could take my wife with me. We decided to hunt with Lee Cox at bull basin ranch in Colorado . The lodge and quality was better than Lee talked about over the phone . we were so impressed with everything .The lodge was amazing and everyone was so nice. We could not have been more excited with our hunt and the beautiful bull elk we took and the whole trip. Lee needs to be more excited when he talks about his ranch on the phone because it is way above what he told us, way beyond our expectations . Great hunt and a great time . This was a father - son hunt of a lifetime . After doing some research I decided to go out to Colorado and hunt with Bull basin ranch . This was a hunt that was very important to us and probably as once in a lifetime trip so I cant say enough about our hunt WOW it was incredible. From the minute we walked into the lodge I new we made a good choice. The lodge and meals rooms ,outside decks and the scenery were amazing. As soon as you go in the lodge you feel at home ,very comfortable ,and the Mule deer all around the lodge and area were great to see. We were able to hunt together and see each other take our bulls was really special . Our guides were really great they taught us a lot while we were hunting and took excellent care of us during our elk hunt . I want to thank everyone at bull basin ranch for a great hunt and experience . We did a father -son hunt here at Bull Basin Ranch this fall and it was a wonderful amazing time. My son and myself hunted together and got to share that experience . We both took really beautiful bulls and had the time of our lives. Did some trout fishing with a fly rod for the first as well what a hoot. I can’t say enough about the whole hunt and everyone there .Such great people who took such good care of us from the time we arrived to helping us get our meat processed and shipped home. What a great time .